"Terabyte hard drives were only for, like, space stations," said Senior Editor for Geek.com, Jordan Minor, recalling when he was kid and thought that "a terabyte was such a huge, incalculable amount of space that surely no one person would ever need that much storage." In 2019, Minor knows better. "People chew through terabytes of space like it was nothing, recording hours of huge 4K video files about their day at the park or whatever." Paul Ridden, Managing Editor for New Atlas in Europe: "With a bunch of digital cameras now able to record video is glorious 4K UHD resolution and 360° cams able to capture all-around scenes, even the highest capacity memory cards may start to tremble at the prospect of storing all that data." Consumers—enthusiastic photographers, content creators—seek greater storage for their cameras and a new, mammoth SD card is making news this month, as the first commercially available one terabyte SD card. Lexar announced the card on January 9. Capacity alone became the key talking point, with a capacity to store 1 terabyte of photos and video. 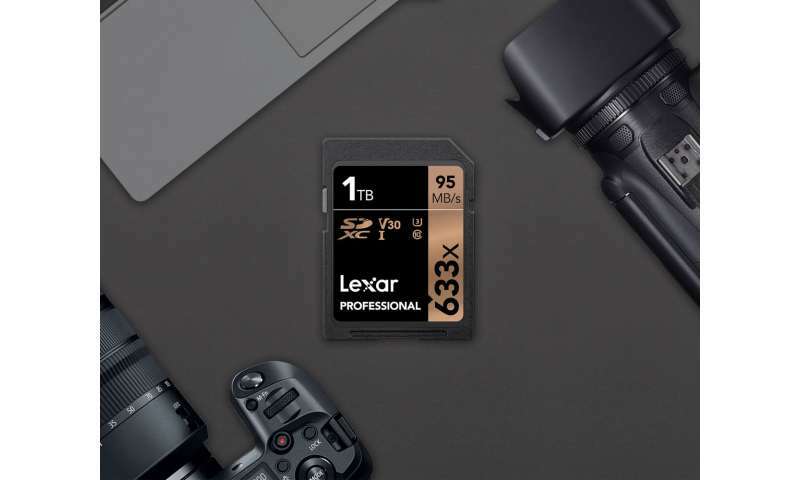 At CES 2019, Lexar unveiled the 1TB Professional 633x SDXC UHS-I memory card. If you are a photographer, then the one-terabyte sticks—as an attractive storage solution for high resolution videos and photos. You can enjoy shooting longer. "As a photographer or videographer, an SD card sized at 1 Terabyte allows you hold more content for longer periods without hassles," said Dignited. Minor similarly said, "This new card is made for professionals, serious camera folks who constantly fill up SD cards shooting lots of photos and videos all day in the highest possible quality, so they don't need to keep track of so many cards." Reports said the card makes the most of Class 10 UHS-I (U3, V30) technology for an impressive read transfer speed. Paul Lilly in HotHardware said, "Lexar appears to be the first to market with a 1TB SD card for consumers." Engadget similarly reported that Lexar will sell the "first ever" 1TB SDXC card. Sites nonetheless nodded to SanDisk, which earlier spoke about the tech, back in 2016. However, said Dent, that card was never commercialized, while Lexar's card is available for purchase. "Almost 15 years ago, Lexar announced a 1GB SD card. Today, we are excited to announce 1TB of storage capacity in the same convenient form factor," said Joey Lopez, Lexar senior manager for social media marketing. Lopez also said "the combination of high-speed performance with a 1TB option now offers a solution for content creators who shoot large volumes of high-resolution images and 4K video." Adam Armstrong in StorageReview.com wrote that the card was "a class 10 that leverages UHS-I technology to deliver read speeds up to 95MB/s read and up to 70MB/s write." The card watchers also underscored the advantage of transfer speeds of up to 95MB per second. But wait. Do you think this 1TB is a tad OTT? Chris Davies in SlashGear commented, that "Indeed, it's a frankly ridiculous amount of storage to be had in a single card," he said." If you were shooting 4k video at 60fps and 200 Mbps, for example, you're looking at 25MB per second. That would mean you could fit around 640 minutes of 4K video on this one memory card alone." His numbers were similar to the numbers suggested in TechRadar: "To put that kind of storage into perspective, you should be able to fit about 650 minutes worth of 4K footage on a single Lexar Professional 633x SDXC UHS-I card. The 1TB card is priced at $499.99. Compatibility issues? "Lexar product designs undergo extensive testing in the Lexar Quality Labs, facilities with more than 1,100 digital devices, to ensure performance, quality, compatibility, and reliability," said the company's release. Engadget's Steve Dent, well, why blame him for only musing: "If we keep going at the same rate, we'll have 1-petabyte cards by 2034." The company describes itself, based on a global brand of memory solutions. Its lineup includes memory cards, USB flash drives, card readers and solid-state drives. According to the company site, Longsys established a U.S. company, Lexar International, based in San Jose, marketing Lexar-branded products in the United States and Canada. Another affiliate, Lexar Co., Ltd, in Hong Kong, PRC, will market Lexar-branded products in Asia.